A Pod and a K-Cup Aren't the Same Thing? There's a whole bunch of confusion these days about what to call the various types of single-serve coffees (and teas). If you're reading this, it's likely because you want to know about Pods and K-Cups. If you are like most folks, you're probably thinking "What do you mean? A pod and a k-cup are the same thing, right?". Wrong. The short answer is that pods will not work in K-Cup machines and vice versa (K-Cups will not work in pod brewers). They are not interchangeable... unless you have an adapter or were smart enought to buy a coffee maker that brews both right out of the box. A Pod is coffee or tea that is sealed inside filter paper. They have a round, flat shape and are usually soft and pliable. They are sometimes individually wrapped in foil or just packed loose in a larger resealable bag. Pods are also known as coffee pads. A K-Cup is is coffee or tea (and recently hot chocolate and cappuccino) that is sealed in some kind of cartridge, generally a plastic cup. The cartridge has a plastic ring covered with a foil top. The inside of the capsule is lined with a filter material and keeps the coffee contained while brewing. When you place a K-Cup into a compatible brewer, there are two needles that puncture the lid and the bottom of the cup. Water flows into the top, extracts the coffee, and out the bottom (the bottom needle punctures the plastic cup, but not the filter paper... usually). The history of the single-serve coffee container goes back well before Keurig K-Cup packs were invented. In fact, coffee pods (as we know them today) were actually invented first, and others before that. While pods were (and are) a great product, it's success was stiffled from the beginning. It was hard to find the pods themselves, there weren't many good pod brewers available, and there was no industry standard size or specification for the pod itself. The Philips Senseo and Melitta brewers were the most successful (both in Europe and the US). These machines, too, faced the uphill struggle of getting their products into consumers' hands. The coffee choices were very limited and many of the ones that were available were not very good. While the Senseo was generally regarded as a good brewer, it had two drawbacks. One, the pod holder was a tight fit that almost made it brew under pressure like an espresso machine. Two, the finished coffee had a lot of foam... something that didn't always appeal to American consumers. The Senseo/Melitta pods were narrower in diameter (55mm or less), were on the thick side, and were almost hard/tightly packed. The K-Cup® term is trademarked by Keurig Green Mountain to describe their single-serve brewing capsule. As defined above, you can identify a K-Cup by the foil-lined, ringed design with a plastic cup. Other modified designs now exist, that eliminate the plastic cup but still use the plastic ring with foil lid. While Green Mountain insists everyone call their products K-Cup® Packs, almost everyone refer to them as K-Cups. If you're shopping for them, it means the same thing. 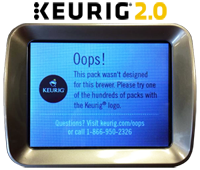 There are different Keurig-branded brewer models for home use and commercial use. Commercial models, for example ones that can plumb into a water line, are exclusively available through traditional office coffee services (OCS companies). These providers have binding contracts with Keurig to install & maintain the brewers and deliver coffee to the customers. They are only allowed to sell authorized Green Mountain brands and have strict requirements for the number of installations and new customers they must get to maintain their status. 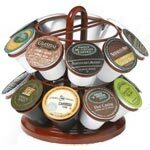 These providers are affectionately known as KADs (Keurig Authorized Distributors). The home models, however, have no such restrictions - you can purchase the brewer from anywhere and the coffee from anyone. When Green Mountain's key patents covering the design of K-Cups, it opened the door for other companies to make Keurig-compatible products. While these cannot be called K-Cups (because K-Cup® is trademarked), there are many that look-like and brew-like "official" ones. Key manufacturers of these knock-off capsules are Treehouse Foods (Grove Square), Mother Parkers Coffee (Marley Coffee), Copper Moon, and Rogers Family Company (San Francisco Bay, Organic Coffee Company). Nearly everyone has a "K-Cup compatible" coffee now. In 2014, Keurig - faced with losing market share to the "other brands" - rolled out a new generation of brewer called Keurig 2.0. They heralded 2.0 as having more customization and brewing formats. Unfortunately, it also included a scanner that read the foil lids of capsules. If the K-Cup didn't have their special ink (think barcode), it wouldn't brew! Only K-Cups officially manufactured or blessed by Keurig Green Mountain would work. This caused an uproar from consumers who purchased the 2.0 thinking they could continue to use their favorite other brand of coffee. Because of the lockout system, customers gave their brewers terrible reviews on websites and wrote lengthly letters complaining about the issue. Luckily, it didn't take long for the competing brands to reverse-engineer the ink system and produce their own lids that were compatible with 2.0 brewers. In fact, in 2016 - months after the launch of 2.0 - they admitted the new system was a disastrous mistake. Despite of that, the K-Cup ecosystem has been wildly successful with a huge consumer market share.